Generations of farmers, miners and craftsmen lived off the rich yields from the mines and fields, and a blooming trade with Venice and Salzburg – but they also had an eye for the magnificent countryside, which they tended with care. The river Drau, protected and embedded between the mighty Tauern mountains in the north and the majestic Alps to the south, has not only always been a generous source of fish, but also gave the woodworkers and rafters their daily bread, and the people of the valley a way of life. Now, century-old traditions are being rediscovered: varlet festivals, rafters’ days, open-air markets, church-days, pilgrimages and carnival celebrations – in the time of the Internet and globalization, a new trend is emerging to discover that which is closest to us: Cultural heritage, regional development and appreciation of the local culture. Tourism got an early start here: the first alpine-clubs were started around 1880, and the first retreats were built before World War I. Famous personalities frequented and relaxed in the Drau Valley, at the Weißensee (lake) and in the mountains of the Reißkofel and Kreuzeck groups. Artists, writers and painters like E.T. Compton were among them. The Glocknerhof has specialized in traditional hospitality, warmth and closeness since the 60s, and is dedicated to contribute to the maintenance of culture and heritage. The house has offered guests and visitors an ambience typical of the region for decades, with all its culinary distinctiveness. Every time I travel or meet colleagues, I am asked how it is possible that such a large tourist-oriented business could develop in such an unknown little town like Berg im Drautal. It’s not easy to answer this question, but I will try it anyway. We should add, of course, that the courage for risk-taking was already an especially pronounced trait of our parents’ generation. Confidence in a positive future in tourism has always kept the upper hand, despite periodically recurring economic crises. I need not remind you that the hotel was built in the early 70s, during the oil shocks. It’s true, one sometimes feel like a prisoner of ones own livelihood, there’s too little time for personal things. But those who grow up with this work doesn’t know any different way of life, they live with it. The main thing is the love of the work. With every brick that is added, is the chance to turn life’s work into an artwork. The simple term “Berg” (mountain) was used since ancient times to give name to a large number of regions. In Carinthia alone, twelve settlements were given the name “Berg.” The name goes back to the Aryan root word “Bhergh,” which means “high or raised.” In the Bavarian language-area, names ending with –berg meant “single settlement at the mountain” between the 8th and 11th century. Berg im Drautal was first mentioned as “Perige” in records dating to 1267. The name is also related to the mining that is done in the region. Mines have existed by Drasnitz above Dellach, in Gnoppnitz by Grefenburg and in Jaukenmassiv since Roman times. Legend tells of mountain miners from faraway lands that settled here to dig for lead, silver, gold and other ores. One of the earliest finds are the remains of a roman road that lead to the mining region Gurina in the Gail Valley in pre-Celtic times. Parts of this road are still visible in the “Römersteig” (roman climb) along the south face of the Jauken group. Disused mineshafts, place names like Schmelz (melt) and old house names remain as silent witnesses of the past. 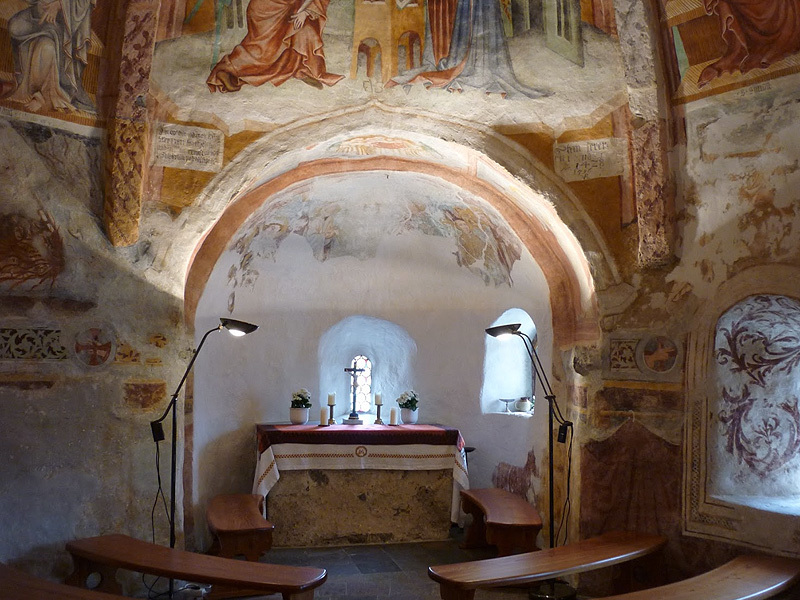 The region’s early importance stemmed especially from its churches of pilgrimage, the St. Maria Birth, St. Athanasius and the Karner St. Michael. The fickle history of the region was influenced by natural disasters, wars, epidemics (plenty of painting date back to Turkish attacks and the plague). Despite the adverse conditions and an austere income, the farmers still cultivated the land for their descendants. Carinthian tourism already began to really bloom in the middle of the 19th century, which the inhabitants then called “Summer Freshness,” where the lakes were of course especially attractive to visitors. Particularly city folk from near and far were drawn to the countryside in the summer months. However, larger numbers of travelers only started coming once the train infrastructure was expanded under the Austrian-Hungarian monarchy. Transportation was almost exclusively limited to animal-drawn wagons, due to the bad condition of the roads and the lack of proper vehicles. 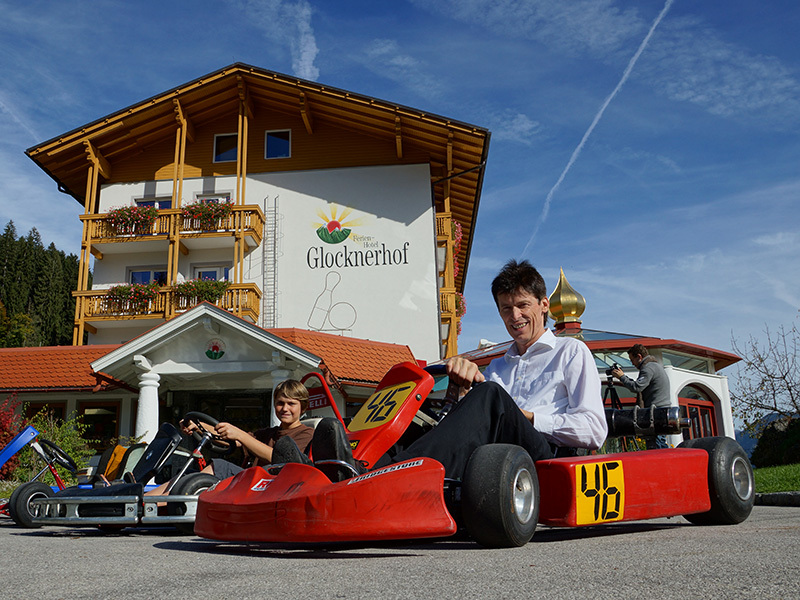 Carinthia is not only now one of the Austrian provinces in which tourism plays an important economic factor. The inhabitants became aware of the special things on offer early on, what the alpine landscape, with its lakes and waterways, embodied in terms of recreational value and tourist need. At first it was only in the summer that guests wanted to come visit. The winter season – because winter sports only developed later, and mostly stemmed from work related activities, as well as poor heating facilities, which meant a certain lack of comfort – only became a holiday season in the 20th century. What is, however, the best on offer for tourists, what use are the best natural conditions, if no guest knows what is on offer here and no one knows how to reach the region? For this reason, it was important to advertise the possibilities of Carinthian tourism very early on, to bring them to the customer. "Central station" 1960: Adolf says goodbye to his guests. In the last quarter of the 19th century, many of the special conditions were in place for the Upper Drautal Valley, that allowed its growth as a “summer freshness” area. On 20th November, 1871, the Südbahn, a southward rail-line between Villach and Franzenfeste was opened after a three-year long planning and construction period. Originally intended as a line for shipping freight within the K. u. K. (Austrian-Hungarian) monarchy, the track immediately and simultaneously provided the opportunity for the Drau Valley to develop itself as a “summer freshness” region, which was of course also used. The train was, as one can deduce for all of Carinthia thanks to the then-new programs, surely an achievement that can be seen as the initial spark for the wave of tourism that was to follow. Attempts to invite vacationing guests became increasingly determined. One of the most important sources that today allow us to understand the offers for tourists around the end of the 19th century, is at the same time one of the most important pieces of evidence for the fact that advertisement and service played an important role back then already. From 1883 onwards, the “Kärntner Verein” in Klagenfurt issued annual updates of a brochure called “Kärntens Sommer-Aufenthaltsorte,” (Carinthia’s Summer Locations), which was understood to be a guidebook for guests, containing the most important and interesting information about Carinthia’s towns. The index was organized according to the political districts of Carinthia and contained locations such as judicial districts, municipalities, nearest post offices, train and telegraph offices as well as altitude. Accommodations, sights, hiking routs, mountain tours and distinctive landscape features were described as well. Besides hiking and mountain tours, the main activities available in the Upper Drau Valley were mainly fishing and hunting. And just like today, places of interest related to cultural history and nature were of course advertised. Around the turn of the century, tourism began playing a role not only around the Carinthian lakes, but had also long since made inroads in the rest of the region. This is evidenced by the fact that in 1891, between Steinfeld and Oberdrauburg, at least 250 guest beds were on hand for tourists, 80 of them in multiple bedrooms, with 90 “Female Rooms” and “Male Rooms” available. These numbers of course give no indication of how much these facilities were used. However, these numbers are a significant piece of evidence, because many places already knew to count the economic factors of tourism as very important. In 1906 – after Berg got its own train station – there were, according to the “Reisehandbuch des Kärntnervereins,” (travel guide) already 12 beds in the guesthouses Breiner, Regensberger and Mößlacher. The town had exactly 417 residents back then. In 1929 there were, according to the “Landesprospekt Kärnten,” 70 beds in the Pension Schader, four beds in the guesthouse Hopfgartner and a further 30 beds in emergency camps available. In the Schader Pension, full board cost between 6 to 8 Schillings per person. At Hopfgartner, it was only 2.50 Schillings. At the end of the 50s there were already over 500 beds, in the 70s over 1000, that the town could offer. 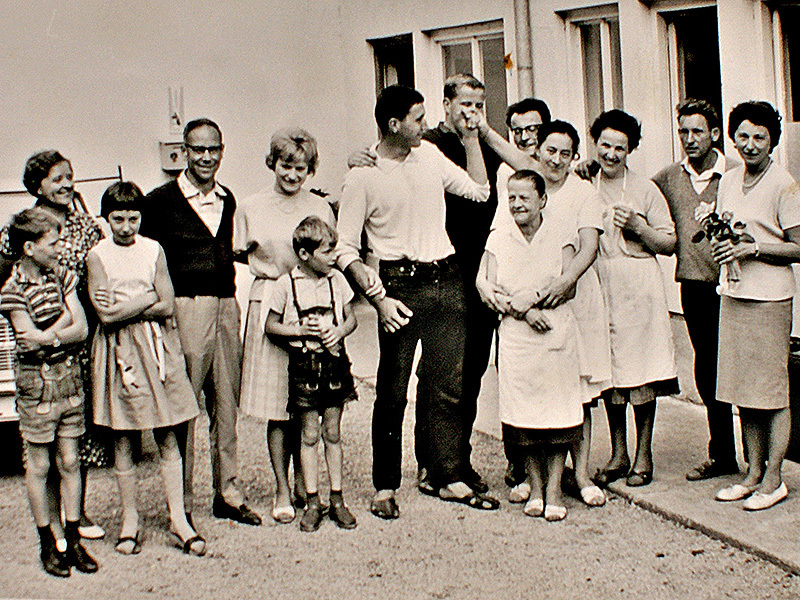 In the Pension Glocknerhof, half-board cost only 28 Schillings in 1959, and full-board only 32. 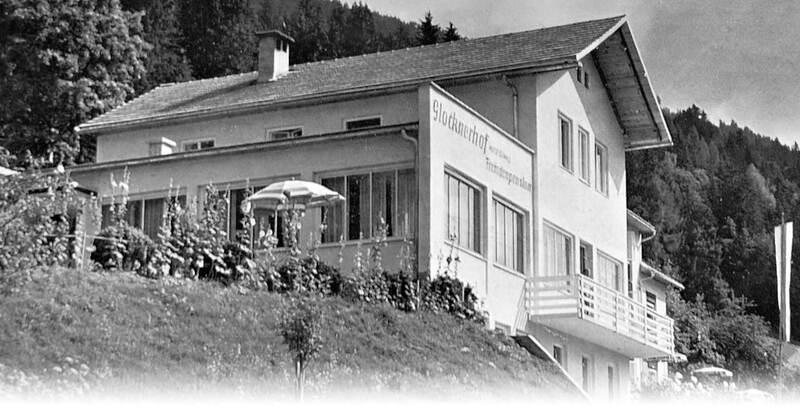 In the first year of the “Hotel” Glocknerhof –1973- full-board was at 240 Schillings. Today, the ratio of inhabitants and guest-beds is almost the same. Although Berg, with a population of 1450, is still the smallest town of the Upper Drau Valley, it was by far the biggest capacity for accommodations with 1400 beds, and with 150,000 overnight stays a year, the best numbers. Today, Berg im Drautal is easily reachable with any kind of transportation. Before the turn of the century, it was mainly reached by horse-drawn carriage, which brought travelers from the nearest train stations in Greifenburg and Dellach here for the price of 1 Guilders and 20 Kreuzers. 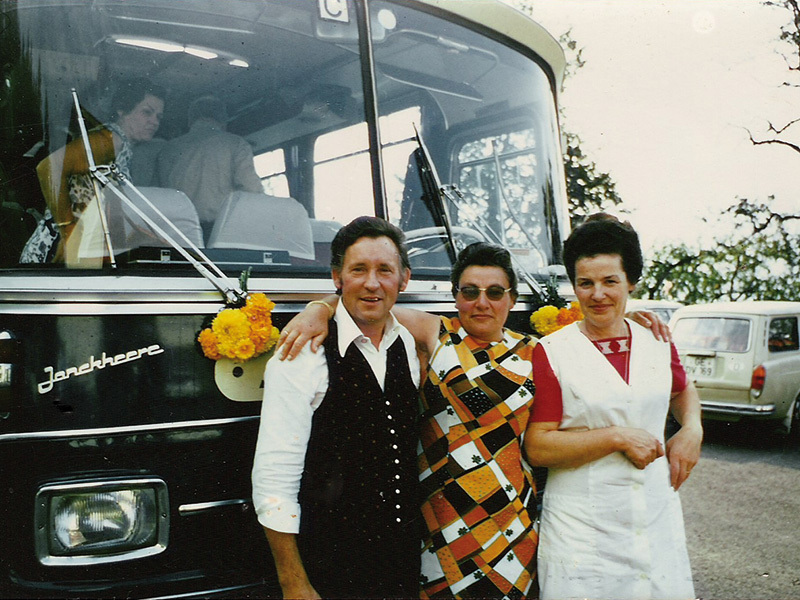 And, if you were a guest of the Glocknerhof in 1959, you would have been picked up in a “convertible” car: the tractor! According to old brochures, the village was unique for its good water, its closeness to the forest and the walking paths. The wildly romantic Gaisloch by Feistritz and Bad Kolm were also worth a trip, as was a group trip up the Hohe Driste Mountain. Fishing and hunting were counted among the interesting pleasures. The wood processing facilities and rafting on the Drau were considered spectacles of the region. But a growth in the number of guests only really started to rapidly gain momentum in the time between the wars. 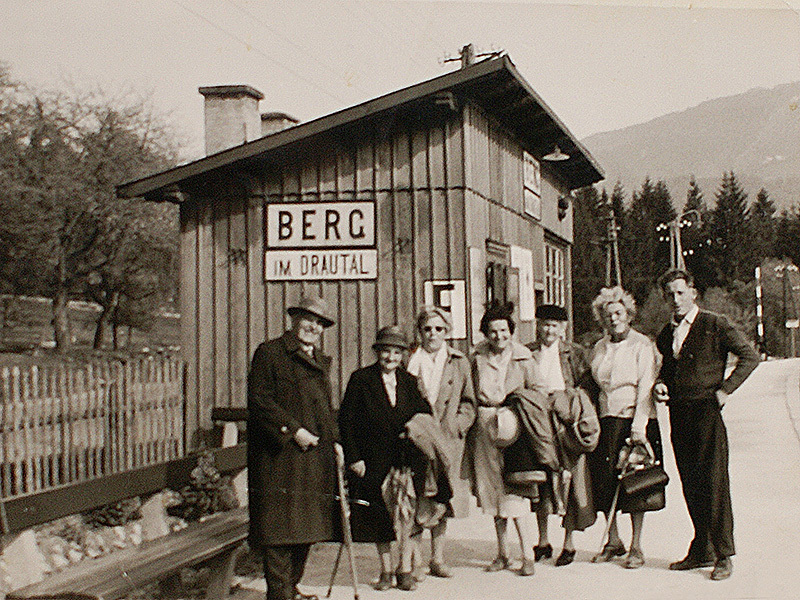 Travelers from the former countries of the monarchy, Germany and – after the introduction of the “1000 Mark Sperre” – increasingly from Italy, came to Berg to set up camp for the summer. 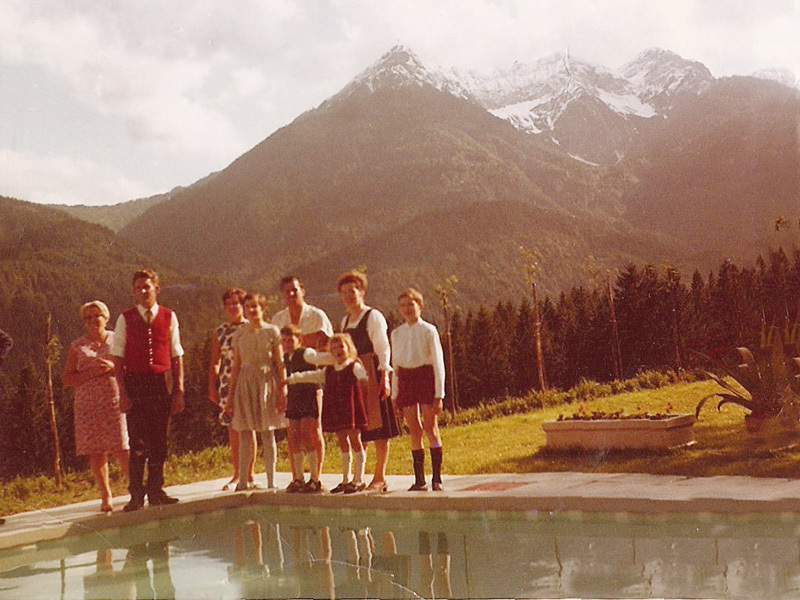 After the bitter years of the war, it was the guests from Berlin and Vienna that re-awoke the tourist industry in the Drau Valley. They marveled at the therapeutic air and waters, took round trips through Carinthia, Italy and Yugoslavia from here, or climbed the peaks of the surrounding area. Winter sports bloomed on the Emberger Alm in the 60s, and lively summer sports came into the mix in the 70s. The 80s belonged to cross-country skiing and health-related activities, and the 90s were dedicated to a re-discovery of culture and lifestyle.